Iron Concentration™ is made from one of the highest bioavailable forms of Iron known as Ferrochel®. It is formulated with a naturally delicious berry flavor and concentrated enough to be put in a convenient dropper bottle. Just one milliliter provides 15 mg of Iron. Ferrochel® is patented, nutritionally functional amino acid chelate known as ferrous bisglycinate chelate. Human clinical studies have shown it to be an iron of great bioavailability and tolerance (easy on the system). Menstruating and pregnant women, athletes, and vegetarians may all have difficulty getting adequate iron from their food. Not anymore! When you reach for iron, chose the gentle one with the natural berry flavor. 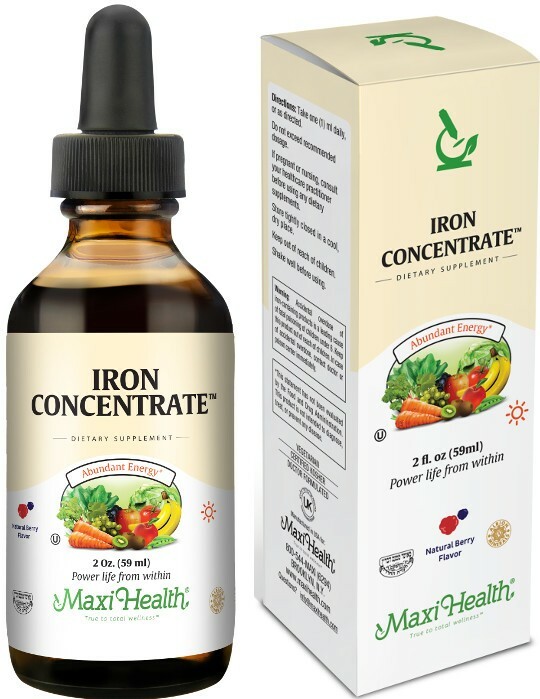 Try Maxi Health’s Iron Concentrate™ - the gentle iron supplement. Take one (1) ml daily, or as directed. Do not exceed recommended dosage. If pregnant or nursing, consult your healthcare practitioner before using any dietary supplements. Other Ingredients: Vegetable Glycerin, Deionized Water, Mixed Berry and Vanilla Natural Flavors, Citric Acid, Xanthan Gum.